Fields required to generate the stimulus are declared in the transaction class. Transaction class can also be used as placeholder for the activity monitored by monitor on DUT signals. So, first step is to declare the 'Fields' in the transaction class. Below are the steps to write transaction class. 2. To generate the random stimulus, declare the fields as 'rand'. 3. Adding display() method to display Transaction properties. 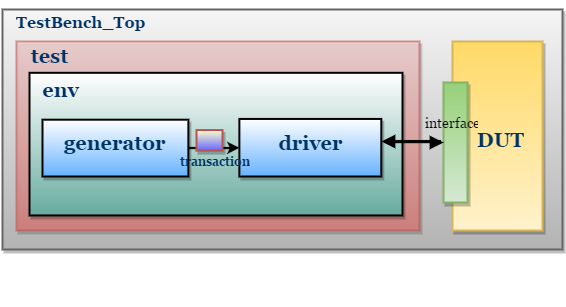 Mailbox is used to send the randomized transaction to Driver. Event to indicate end of packet generation. Getting the Mailbox handle from env class ( because, same mailbox will be shared across generator and driver). 5. Adding event to indicate the completion of generation process, event will be triggered on the completion of Generation process. Interface will group the signals. This is a simple interface without modport and clocking block. receive the stimulus generated from generator and drive to DUT by assigning transaction class values to interface signals. 1. Declare interface and mailbox, Get the interface and mailbox handle through constructor. 2. Adding reset task, which initializes the Interface signals to default values. 3. Adding drive task to drive the transaction packet to interface signal. 4. Adding local variable to track the number of packets driven, and increment the variable in drive task. Environment is container class contains Mailbox, Generator and Driver. Creates the mailbox, generator and driver, shares the mailbox handle across the Generator and Driver. and pass the interface handle through new() method. Generator and Driver activity can be divided and controlled in three methods. pre_test() - Method to call Initialization. i.e, reset method. test() - Method to call Stimulus Generation and Stimulus Driving. post_test() - Method to wait the completion of generation and driving. call $finish after post_test() to end the simulation. 5. Complete environment class code. Test code is written with the program block. Configuring the testbench i.e, setting the type and number of transactions to be generated. //calling run of env, it interns calls generator and driver main tasks. This is the top most file, which connects the DUT and TestBench. TestBench top consists of DUT, Test and Interface instances. Interface connects the DUT and TestBench. Edit and Execute Simple Adder TestBench code in EDA Playground. Click on EDA playground image. "Your valuable inputs are required to improve the quality"